PaizoCon 2014 came and went. 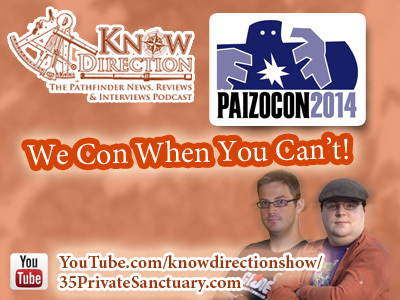 Ryan shares the big news and tells Perram about his new favourite PaizoCon memories. F. Wesley Schneider, Liz Courts, and Patrick Renie take us on a next level journey about how the technology of the future can enhance your game today. F. Wesley Schneider, James Jacobs, Adam Daigle, and Patrick Renie talk about designing monsters for home and publication, balancing challenge ratings, the idiosyncrasy of the Bestiary monster creation guidelines, and some personal favourite monster moments. Hosted by Erik Mona, with words from Lisa Stevens, Jason Bulmahn, Mike Selinker, Tannis O`Connor, Mike Brock, and Ryan Dancey.